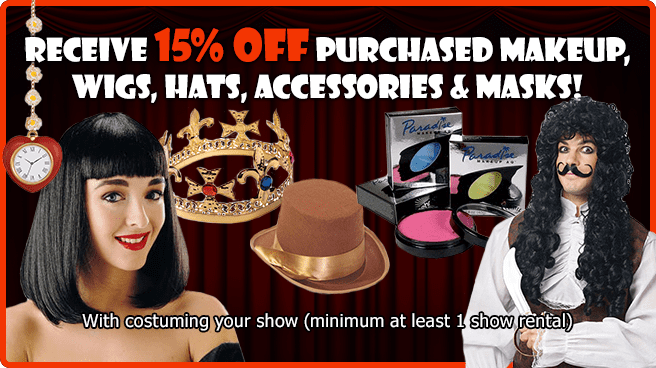 Get Retail Items for Your Production! Wigs can give that little touch to a character to make them more realistic, help when natural hair isnâ€™t behaving, or can take you from a messy ponytail into an elaborate yet elegant style for a quick-change. We offer wigs of a variety of styles and colors, perfect as the come or available to be styled as needed. Dream Glam: Perfect for a Supreme look! Whether youâ€™re going for the Vaudeville commedia dell’arte, the dramatic masquerade of Phantom of the Opera, or trying something outlandish like steam punk, we have all types of styles of masks in stock, plain or glittered out. We carry professional quality BenNye and Mehron makeup. Whether you need just the simple stage makeup, or something far more old and gruesome, we have professionals who can help you look for the correct product to fit your look. Feel like youâ€™re missing something, but not sure what it is? We now offer Retail plots with shows to help you remember those extra little things you might be forgetting! Follow the link to our website to see what shows we have available to rent!